Last month we negotiated our tumultuous relationship with Domestic Chardonnay, and got lost in the alchemy of dissention. “To oak or not to oak?”…“Can America hang on the world’s stage?”… What became apparent, in one long haze of a social media thread, is the innate human gift for setting fluid ideas in stone. It’s a time-honored tradition. We enter this Narnia of a wine community, eyes wide and tail wagging, eager to have our horizons expanded. Quickly, we narrow the field, honing our preferences. Herein lies the rub: Progress arrives on the heels of discernment but requires a perpetually open mind. How do you draw from the same block of marble when it’s already been whittled down and polished? As creatures of habit, we tend to throw stones at the new. And why? Because wine is hard. And after multiple ‘let-down’ bottles, if the glutton can resist writing off an entire category, his/her wallet will put the nail in the coffin. When I found Martin Muthenthaler in mid 2016, a small group were already gathered at the well, but one before the rest. Volker Donabaum was kind enough to share the treasure he had known, growing up in the tiny village of Spitz. By early 2017, Muthenthaler was introduced to the U.S. en masse, having been previously earmarked for the New York market. I must confess, after a couple of low yielding vintages, I didn’t think there would be a 2018 wine club shipment. And yet, here we stand a year later, freshly discharged from a second tour in Austria’s Wachau region. Last year’s blog chronicled Martin’s working-class hero ascension. The headline was too good: Out-of-work Truck Driver Turned Winemaking Superstar. We spared no praise, heaping on the highest hopes for ‘A Legend in the Making’. And in 365 days, he’s done nothing to disappoint. Today’s discussion traverses the same geography, but shifts the philosophical landscape to explore change in its various forms. 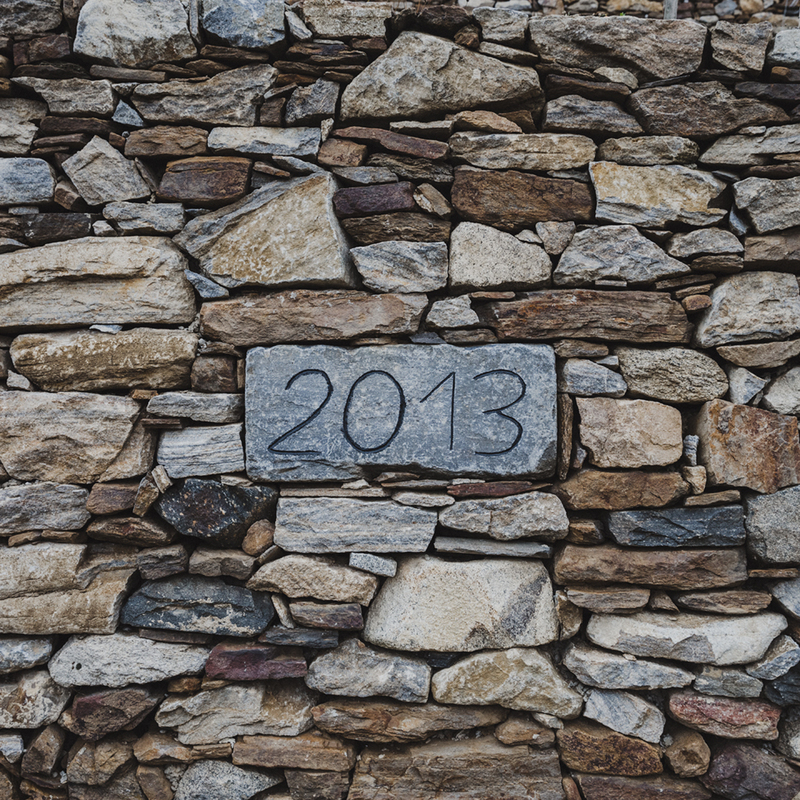 From institutions to anarchy…Riesling to Grüner…market trends to climate trends…no two days are the same for the ever-evolving Muthenthaler regime. And for a man whose gaze looks firmly forward, he wouldn’t have it any other way. Austria trip Part II started with a bang. Volker’s plane pulled a u-ey over Iceland after a hydraulics failure, which is never a fun announcement from the inflight crew. Martin managed to throw out his back and remained supine in hometown Muhldorf. So, the Americans were left to their own devices for two days. There are worse places to wash ashore than the Imperial City. But this would be a different Vienna from just a year ago – that pesky natural wine movement, storming the nation’s capital with two freshly-minted wine bars: Heunisch & Erben and MAST Weinbistro. Joining a gaggle of ‘green drinking’ establishments, this feels more like a sign of the times than an isolated novelty. So, before reuniting with a banged-up winemaker and a now-aviophobic importer, I was left to consider the catalyst behind this paradigm shift in Vienna. Is it as simple as the cult globalization of natural wine, weighing heavily upon a new generation of business owners? Or is this a grass roots phenomenon, emanating from the vineyards surrounding Vienna? All arrows point south, according to Kamptal producer Matthias Hager. 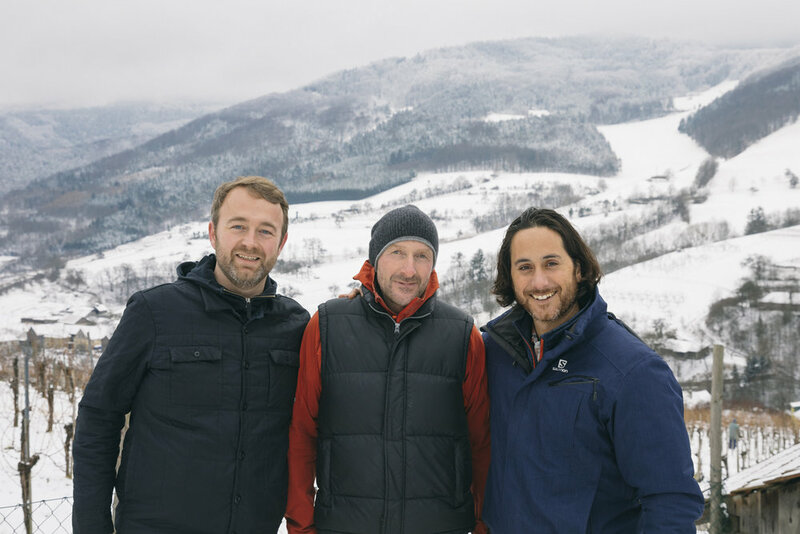 “The natural wine movement began 15 years ago in Styria. Sepp Muster and Werlitsch were the first ones, adopting natural methods from Slovenia.” Martin Muthenthaler adds, “From there it moved north to Burgenland with producers like Claus Preisinger and Judith Beck, and on to the Kamptal...”(Matthias Hager, Alwin Jurtschitsch , etc...). Kultur Wachau wrestles with thinking outside the valley. 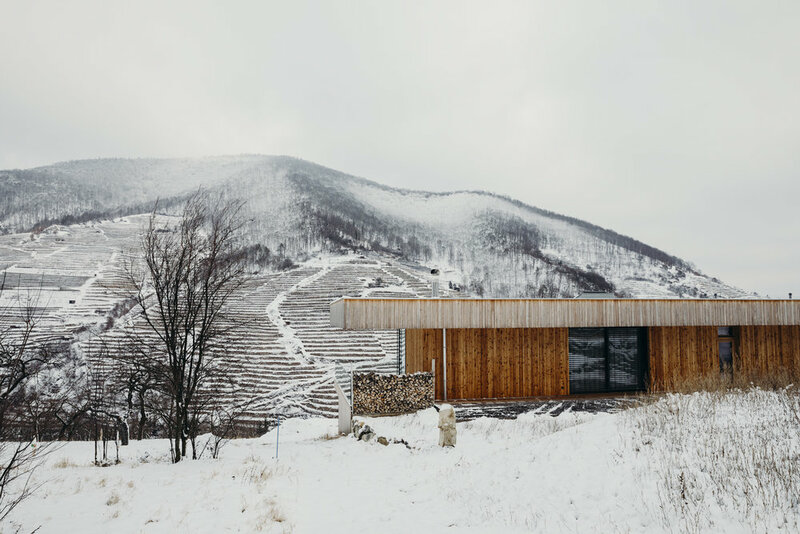 For a nation, second only to Lichtenstein in the percentage of organic farms in Europe, what has spread more fluidly in other Austrian winegrowing regions, has gone against the grain in the Wachau. “You can count the number of organic producers on one hand,” adds Martin. It’s understandable. When your last few albums have jumped to the top of the Billboard charts, it’s hard to justify exploring the studio space in pursuit of a different sound. The Wachau is Austria’s crown jewel – blue-chip vineyard land at blue-chip prices. In its humanity, we find a collection of small, rural villages, sequestered in a river valley, whose inhabitants seem rather unsettled by the avant-garde. They just happen to make jaw-dropping wines. Some, who remember the summer of 1985, would say “‘Twas not always so.” After German wine labs caught the addition of diethylene glycol (an ingredient in antifreeze) in Austrian wines, the country went dark. It’s important to note that the wineries who were hurt most by the scandal were blameless on all accounts. Of the 27,000,000 liters of wine recalled by German authorities, not one drop belonged to the Wachau. Yet, having gained worldwide recognition for their Riesling and Grüner Veltliner, the region became a casualty of war, unilaterally banned from just about every export market. CHEZ MALBERG - WHERE YOU AT ARCHITECHTURAL DIGEST? 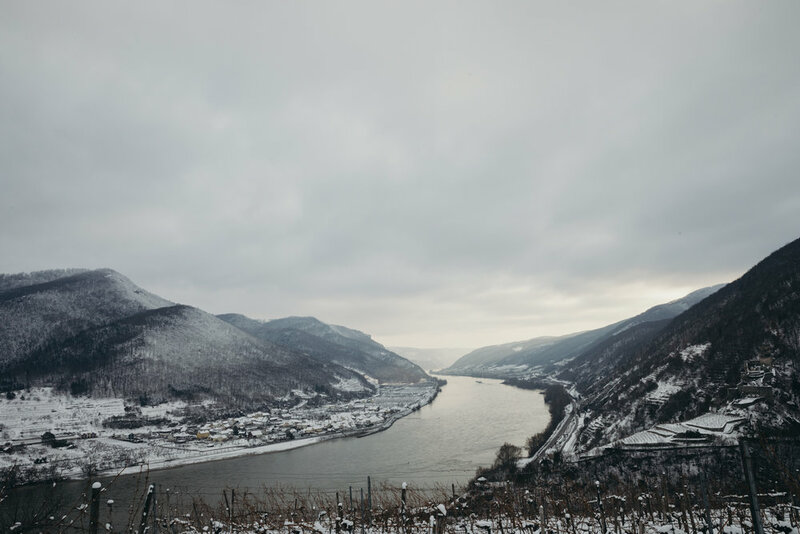 By the time Peter Malberg (Veyder Malberg) came to town, it was 2008, and Wachau wineries were only beginning to contemplate draft one of dial back the ripeness. Despite a reputation for some of the driest Riesling in the world, the Wachau’s use of sugar and botrytis for textural balance and complexity is still a very common and highly-skilled practice. Some indulge less than others. “I like my wines bone dry and botrytis free” states Peter. 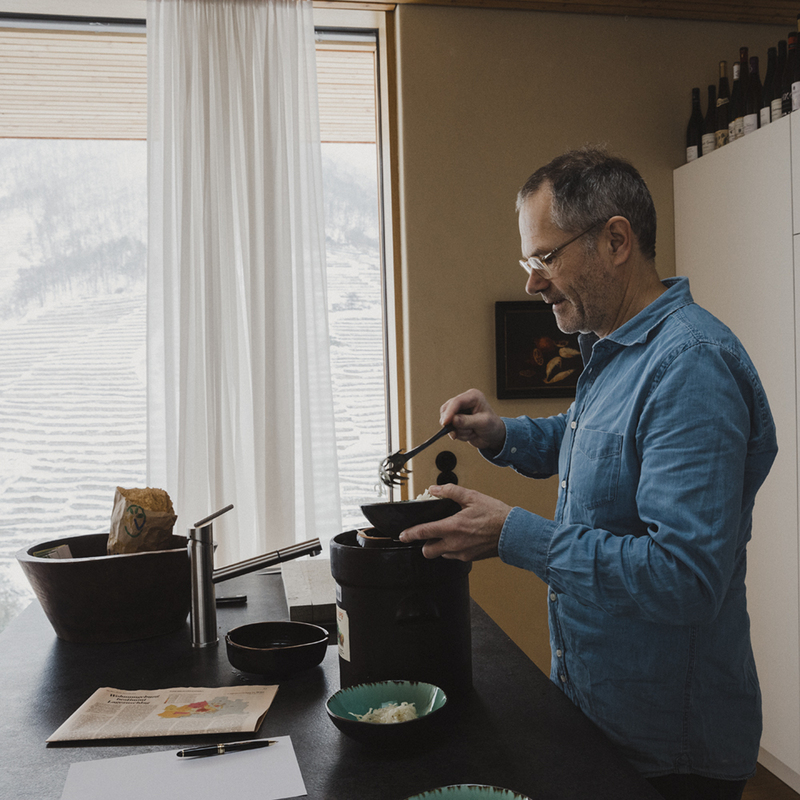 When pressed for why he avoids botrytis, the answer is uncomplicated, “I don’t want to make wine from grapes I wouldn’t eat.” When you combine a fairly outspoken anarchist with a minimalist playbook – organic farming, natural yeast, very early picks and low sulfur – you can imagine how well Peter went over with the Wachau establishment. “Over there on the other side. You see those vineyards?” Martin points. “Those are new north-facing parcels that will go into Spitzer Graben Grüner.” Traditionally, vines exposed to the north will struggle to ripen – an extra hectare or two providing a bit of climate change insurance. “With warmer temperatures, we have to think differently, farm differently…” Martin continues, while hiking up to Brandstatt. The current weather – along with a shot of lidocaine from the doctor – bring Martin comfort. “Snow helps burn away unwanted grasses.” Free labor is a precious commodity among the wounded. A quick barrel tasting at Martin’s house reveals an added layer to the house style. He doesn’t approach wine the same way he did in the beginning (2006). He doesn’t approach wine the same way he did last year. The lineup from top to bottom was textbook Muthenthaler, soulful and transparent, but with an ethereal ease that hints at where this is all going. “I am more measured with my use of sulfur, and I’m starting to utilize more neutral wood on the top cuvées.” The forwardness of the 2017 vintage undoubtedly played a hand in how complete these wines felt, but the extra level of refinement is a testament to craft. Well, I had really hoped to discuss broad market perception of Austrian wine in the U.S., in addition to efforts on our own soil with standouts like Graham Tatomer, but we just didn’t get there, did we… I had also planned a deep dive with Grüner Veltliner, a grape that has made quite the splash in our backyard over the last decade. Free from the shackles of Riesling’s “is-it-sweet?” stigma, Grüner keeps on trucking. If the grape has been thrown any shade in the marketplace, perhaps the 1-liter jugs and attractive price tags have pigeonholed Grüner as “the fun guy.” Point Break Keanu is a guilty pleasure. Matrix Keanu has a bit more to say. But alas, I’ll let Martin’s wines do the talking.